1.5 Setting:Power Rain,Pulsating Massage,Rain/Massage,Rain/Mist,Hydrating Mist. 2.With Angle-adjustable overhead bracket,will meet your different requires. 3.5"diameter chrome finished spray face provides wide water coverage. 4.Brass hose nuts can be tight by hand,without tools. DURABLE DESIGN:Made of high quality ABS body and stainless steel hose,never rust,lightweight.About 5" diameter chrome finished spray face provides wide water coverage. MULTI FUNCTIONS:With 3 different functions:Power Rain,Pulsating Massage,Rain/Massage. ADJUSTABLE BRACKET HOLDER:Come with American overhead bracket holder,3-way water diverter with Anti-swivel lock nut.Can used as overhead or handheld shower. You can rotate the shower head within 360 degrees. EASILY INSTALLTION:Drill a hole on the bathroom wall,then fixed the bracket holder.Connect the hose to the bracket and showerhead.Last,place the showerhead on the holder.Not need other tools. RETURNS ARE GUARANTEED: 100% refund are guaranteed. We are proud of the quality of our shower heads. 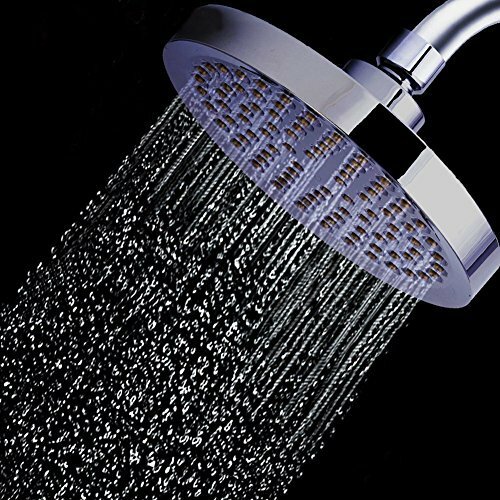 For any reasons, if you are not satisfied with the shower heads, we are willing to refund every penny you paid to live up to your expectations! Welcome to buy the shower heads and wish you have a good shopping experience! If you have any questions about this product by Basong, contact us by completing and submitting the form below. If you are looking for a specif part number, please include it with your message.